A few years ago, pencil, ruler, and scissors are the main tools for creating crafts and designs that you might use for a birthday party decorations, home decors and designs, and even sewing. Now, with the combination of advanced technology and great minds filled with curiosity, crafting is now easier than ever. For real crafting enthusiast, Cricut is but a common word. Made by Provo Craft & Novelty Inc., Cricut is the brand name of home die-cutting machines which can be used for scrapbooking and other projects. Die-cutting is the process of using a die (a specialized tool used to shape or cut materials using a press) to shear webs of low-strength materials like sheet metal, foam, plastics, paperboard, corrugated fiberboard, paper, cloth, foil, fiber, and rubber. Cricut machines are mainly used for cutting fabric vinyl, felt, paper and other crafting products. The very first Cricut machine has 6 inches by 12 inches cutting mat. The images can be cut in a range from 1 inch to 5 ½ inches tall. This original Cricut is compatible with all first Cricut cartridges. However, it does not possess the ability of newer models of Cricut which can cut a wider variety of materials. The original Cricut, however, can make Deep Cut Housing and Blade, which allows a user to cut materials that are 1.55mm thick like stamp materials, chipboards, and magnets. When compared to the previous model, Cricut Expression offers more advantages. First, it allows its users to cut fonts and shapes in a range from ¼ inch to 23 ½ inches. It comes with 12 inches by 12 inches cutting mat with adjustable slides that eliminate the hassle of trimming the media to 6 inches by 12 inches. Cricut Expression can cut a wider variety of materials such as thin foils, vinyl, chipboard, fabric, and vellum. In order to preview the work, an LCD screen is added with features such as Auto-Fill and Quantity. They also added a mode called “Paper Saver” and choice between Landscape or Portrait Orientation. It includes 2 cartridges: Accent Essentials and Plantin Schoolbook. An update of Cricut Expression, Cricut Expression 2 shows off an all-new exterior. Like the Cricut Expression, it has 12 inches by 12 inches cutting mat. However, this particular machine does not have a keyboard like the original and Cricut Expression have. Instead, it boasts an LCD touch screen in full color. Its LCD touch screen allows you to see where your image will be on the mat prior to cutting and displays the keyboard on the screen. Also, it has an added feature of image rotation and independent image sizing directly on the LCD screen. It is a small electronic cutting machine for personal use. It has a unique mat size of 8.5 inches by 12 inches and can cut images in a range of ¼ inch to 11 ½ inches. Not like the previous Cricut machines, the Cricut Mini only works with the use of a computer. Standing alone, it cannot cut an image. You will need to use the Cricut Craft Room software. It contains more than 500 images which are unlocked automatically when it is connected to the Cricut Gypsy device or Cricut Craft Room. The Cricut Mini does not have a port for cartridges which is compatible with all Cricut cartridges except for one: the Cricut imagine cartridge. The Cricut Explore Air is an electronic die cutting machine with embedded Bluetooth for wireless cutting of materials from fabric to paper and more. An updated version of Cricut Explore Air, the Cricut Explore Air 2 works much faster. With an added feature called “Fast Mode”, it makes writing and cutting 2x faster. “Precision Mode” perfectly makes the most intricate cuts. Cricut Explore Air 2 can cut over a hundred materials from specialty materials such as bonded fabric, cork, and glitter papers to iron-on, vinyl and cardstock. It has a double tool holder which keeps the pen and blade at hand and seamlessly shifts between embellishing with a written note or cutting a shape. Control your Cricut Explore Air 2 without any wires with its embedded Bluetooth technology that helps you connect to your mobile device or computer. It comes with Design Space software for Window, iOs, and Android devices. It has an Offline Mode which allows you to download projects and images to use when offline. 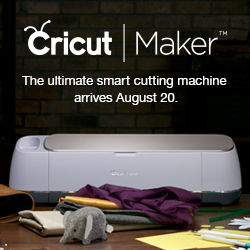 The Cricut Explore Air 2 has 50 ready-to-make projects with projects that demonstrated what it can do. It is compatible with all Cricut Cartridges. The newest addition to the Cricut family, Cricut Maker can cut thicker materials like Basswood and Balsawood and also non-bonded felt, leather, and fabric. It has a digital sewing pattern library with hundreds of the pattern from brands like Riley Blake and Simplicity which you can access. The Cricut Maker comes with an expandable suite of tools— powerful scoring tool, pens, and blades— which scores, writes and cuts more material faster and with greater control and precision than ever before. Washable Fabric Pen – a pen that automatically marks pattern pieces for you to always know how they fit together. Knife Blade – an extra-deep blade which slices through thicker materials like a 2.4 mm matboard or balsawood with ease. Rotary Blade – This sharp blade cuts through any fabric accurately and quickly without any backing materials because of its rolling and gliding action. It also features an Adaptive Tool System which intelligently controls the blade’s direction and adds 10x cutting force. It is fully equipped with advanced features like Offline Mode, SnapMat and Print Then Cut. It also includes 50 ready-to-make-projects, with 25 patterns for digital sewing and other projects for demonstrations of what this machine can do. Cricut Essentials are other equipment and accessories that help add the finishing touch to your projects. Cricut Essentials have what you need to finish details, handle delicate pieces and prep materials. Just finished cutting an iron-on project? What’s left to do is to stick it to your clothes, pillows, and others. Cricut EasyPress finishes the job in just a minute or less. With its simple controls, huge heating surface and safety features, you will have a professional iron-on result that will last for a very, very long time. Cricut BrightPad has an ultraslim profile and adjustable LED light that allows you to see every detail as you are tracing, weeding, jewelry-making, or paper-piercing quilt patterns. The Cricut BrightPad is essentially suited for lighting up hard to see cut lines in iron-on and vinyl. Whether you need to cut something down to size, grab a teeny edge, or smooth things out, these accessories that are carefully engineered and designed will guarantee that you have the right tool for each and every crafting tasks. Cricut also has their own collection of high-quality materials you will need for crafting such as iron-ons, vinyl, paper and more that are all designed to be perfectly cut by the Cricut machine. With different finishes ranging from sassy, flashy and fun to refined, rich and polished, these materials will surely provide you with the exact look you are after. Cricut has premium cases for storage, protection, and organization of machine and supplies. You can use it for everything you might need on the road or organize things at home. Functional, sturdy and stylish these cases are built to last a very long time of crafting nights and DIY days. The simplest explanation is that Cricut is a cutting machine that looks like your typical printer. Except that instead of printing, Cricut cuts a design on whatever materials you choose using a very precise blade and a series of rollers. Amazing right? Cricut can also “print”. With the use of Cricut Pen, you can draw out your design. You can also score or emboss your design if you want. It all depends on what accessory or tool you mount in the dual cartridge head of Cricut. In order to create a design, you will need a free web app available for Mac and PC called “Cricut Design Space”. If you want to use your iPad or iPhone to design, you can use the app Design Space for iOS, or if you are using Android, there is beta-version of Design Space for Android available now. Design Space is a software that helps connects your computer or device to the Cricut Machine. There are thousands of pre-designed projects in the Cricut Design Space library that you can create yourself or download. You can either customize the design or make the project exactly as it is. When clicking a project from the library, you will see options to “Make It Now” where you can recreate it exactly as the original design or “Customize It” where you can change the text, resize it and more. Or if you are feeling the creativity, using the design tools within the Design Space, you can create a brand new design from scratch. You have the freedom to add or upload your own images and text, resize modify colors and shapes and more in order for you to create the perfect design you will love. Once you have the design that you want, it is time for the Cricut Machine to shine. This step is really, really simple! All you have to do is turn the machine on. In case, this is your first time to use a Cricut Machine, then you might need to pair your computer or device with the Cricut machine first via Bluetooth Technology. After the first time, you do not need to pair the machine every time you open your Cricut machine since it will automatically remember the pairing and will always be ready for action. The last step is for you to send your project to the Cricut machine. If you really are happy with your design and is now ready to create it with your Cricut machine powered on, you just need to press the “Make it” button at the Cricut Design Space’s top right corner. The software will start previewing all different mats. For each mat is a 1 sheet of material. In case you have 3 different colors for your projects then you will need 3 different mats. If you are using a fabric and paper for your project, you will need 1 mat for each material. The first thing you need to do on this screen is to set the quantity that you need to cut. For instance: If you are making 2 cards, you can tell the software to create 2 project copies from the top left. The standard size for most materials you will be cutting is 12 inches by 12 inches. However, if you want a different size, you can change it from the Material Size drop down. And if you are creating an iron-on design, then click on the “Mirror” to flip your design so that it appears correctly on the finished project. If you have set all desired settings and are now ready to send your design to the Cricut machine, click “Continue” from the bottom right corner. It will then walk you through the loading of materials and setting the dials. The machine will start with Mat 1 and moves on. You need to choose the material that you are going o use for the 1st mat and then set the dial for the particular material. The Cricut machine will adjust the blade’s speed, pressure, and depth automatically in order to ensure that your project will come out automatically. Put the material you will use on the Cricut cutting mat and load it into the Cricut machine. In case you are using 2 or more materials for your project, then you do not need to worry since the software will help you through loading multiple materials. Once you have cut out every mat you can now assemble all cut-out pieces and you are done. From jars and coffee mugs to framed arts and wall graphics, vinyl is the one material to create an easy and quick statement. You only need to choose a design from thousands of selection, place your vinyl in the machine and press the Go button. Vinyl designed from Cricut machine will always deliver perfect results. With hundreds of digital patterns available from top brands like Simplicity, Cricut machine revolutionizes the traditional sewing craft projects. With just a few clicks and the strong cutting power of Cricut machine, you can immediately create your own stuffed animal or doll. Iron-on is possible with Cricut machine with a wide range of effects, finishes, and colors which are perfect for customizing pillows, bags, scarves, t-shirts and so much more. Just cut a design and use the Cricut EasyPress, or an iron if needed, in order to apply it to your desired project. The Cricut Knife Blade is now better and reliable than ever! You can now cut matboard, chipboard, balsa wood of up to 2.3 mm thick. Create wall art, architectural models, skeletons, puzzles and so much more! Paper has been the original crafting material ever since. It comes with a wide range of finishes, weights, textures, sizes, and colors. You can use it for so many things such as notes, cards, paper flowers, table settings, or party decorations. Your imagination is the limit! Save more time for creating a great gift. With Cricut machine, cutting quilt blocks is now easier, faster and more accurate than ever. You can start with your own digital design or find one design from Rile Blake. You can skip all the hassle and time-consuming cutting of all block with your own hands and let the Cricut machine do the job in a minute. A birthday party? An anniversary? There is nothing more beautiful than giving a customized card in order to show some efforts and that you really care. You can use the Cricut Pens to create beautiful “handwritten” envelopes or pens. Or you can bring a wide range of materials together such as fabric, foil, corrugated cardboard, decorative papers, crepe papers or cardstock to create a unique, connecting composition. Cards are very easy to design and make and are perfect for any occasion. Stencils add an amazing flair to a wide range of projects, big or small. It is very easy to create with the help of Cricut Machine. Cricut Machine helps deliver sharp masks for a detailed etching on metal jewelry or glassware and even large stencils that are up to 12 inches by 24 inches for decorating large surfaces like furniture and walls. Always in trend, Leather is a must-have accessory for most people. With the help of Cricut machine, leather crafts can be more accessible than ever. You can use Cricut Knife Blade in order to cut a wide range of grains that includes extra thick, split and full grain. You can find the best leather project at Cricut leather collection library. Printables are the perfect way to show your own personality. You can create customized printed iron-on, decals, and stickers in just a minute. Just use the Cricut printer to print designs you want on the material of choice. After that, use the “Print then Cut” feature from Design Space for a perfect cut out. You can print on iron-on, vinyl, sticker paper as well as a magnetic sheet. Furniture— what you see is what you get. It is really hard to find furniture that suits your style and taste. However, with Cricut Machine, you can do something about it and add your own style and design. You can add texture or color to a table, add a vinyl motif to a dresser or dress up a chair. With Cricut machine, it does not take much to turn boring furniture into something so awesome! Cricut is not just an innovative electronic machine that can create crafts easier and faster. It is also a great machine that offers thousands to probably millions of design and style possibilities that can awaken every crafter’s imagination and creativity to create endless craft ideas and innovation. We all have this creative mind which can imagine different ideas, designs, and patterns for our sewing project. Of course, with the help of the Cricut machine, we can all make those ideas possible. If we love what we do, then we will surely enjoy making different things out of sewing different patterns. Maybe at first, you’ll find it difficult, you may fail in creating 1 or 2 first projects but if you’d just follow the steps then you’ll make it. I guess when you’ve done perfect projects already, you’d get addicted in sewing with Cricut machine. Here are four examples of an easy craft sewing pattern with a Cricut Machine. 1. What we will do is a Halloween theme Table Napkin. First, you need to prepare the materials you will use. Then, the steps on how to create patterns thru the Cricut machine. Connect your Cricut machine to your computer. Open your Cricut into your computer. Select the ‘Create new project’ and on the left menu bar, click the shapes icon. Select a square and resize it to the largest size that the Cricut machine can cut. 11.5 X 11.5”. Add another square with 11.25X11.25” size. Create a smaller square in the layer panel by clicking the black circle by the scissor’s icon. Choose the button ‘WRITE’ and click on the Washable fabric pen which will write a bright blue color. Click the button ‘MAKE IT NOW’, and you will be instructed to manually insert the washable fabric pen into the machine. The machine will do the square pattern and also cut if for you. Now, it’s your turn to sewing the cut fabrics by the use of another Cricut machine. That steps may sound difficult, if you still want some easy way to create a Table Napkin, here is the video. Everyone has a difference, something with sleeping. Some people can’t sleep while lights are on and others can’t sleep while lights are off. So, what if you sleep with a person who wants to just let the lights on while you want it off? Here’s a solution to your problem, a sleep mask. This mask can be done in 30 minutes and you can make this as a present to your friend who can’t sleep also, like you, when the lights are on. Since you already have the sample steps in number 1, it will be also easy for you to make a sleep mask. As an additional guide, here is a video creating Sleep Mask. You can cut the fabric scraps into same sizes squares and make it like this. For 30 minutes you already have a mug rug. This project is the same in number 1. But this time it is bigger and it is properly sewed back-to-back. Unlike the table napkin, it can only be one-sided. In creating a mug rug, you don’t need new fabric to create a beautiful one. You can get the excess fabrics you have used in your previous sewing project. Having a creative mind, will not only give you a beautiful masterpiece but also you can save money. Here is a Video In Creating Mug Rug, it may be different but at least you will have an idea on how to do it. It may look like this one but its bigger. Creating a makeup bag is more challenging because it includes here a zipper. But, just enjoy doing it and you can create a beautiful one. Just Watch This Video as your guide. There you go. You have three samples with steps on how to create a pattern in the Cricut machine, a different design that you can create out of creativity, and video you can watch to learn more about sewing patterns with Cricut machine. We have different ways on how to greet our loved ones on their special day. You can greet them through text, chat, or video call. But, do you think they can still keep that memory when you only sent it by technology? Is someone still use cards for greetings? To some people who want to be remembered by someone who they have greeted. They prefer to give them cards. Cricut machine can make a way for you to think and create a do-it-yourself product that you can give to your loved ones. Aside from creating items made of fabrics, let us also try to create something out of papers. Cricut has different machines that we can use in doing something special for our loved ones just like a birthday card. The machine has different ways to create designs for our birthday card. I will give you some ideas of what will you do in your Birthday Card Presentation. If you want to surprise someone, start it with the cover. If you put an effort in doing the cover, he or she will be excited in reading your message inside. Cricut will help you do the card-cover. You can also pick designs from the program. To create an amazing card-cover design with Cricut machine, watch this video “How to create a Birthday card with the Cricut Explorer air” for the step by step process. You can see in the picture is a sample finished product. This birthday card has a soft texture in the greeting word Happy Birthday. You can give this to your Mom or Dad. All you need to do is to prepare the design in the software and the Cricut machine will print out the design. And the proceeding steps will be done by you. Here is the video on How to Create That Kind Of Birthday Card. Here the sample image of the card. If you want something new, try to make a pop-up birthday card. Of course, the same thing. Do it in the design, letters, and shapes in the software. Then it will give you a cut birthday greeting. What you need to do is to fold it many times to make it pop-up. For further and clear instruction. Watch this video “Cricut Explore Happy Birthday Pop-up Card” and make a cool birthday card. Aside from video, here a picture also. You can also put an object or shape in your design just like a balloon. The same process, use the Cricut software to design and print out then do the finalization. Sample image of the finished product. There you go. You already have four ideas for your Happy birthday card. You can give it to your Mom, Dad, Grandparents, sister, brother, or to your best friend. Aside, from birthday cards you can also create thank you cards or sorry cards with the help of Cricut machine. Cricut machine is a big help for your surprise plans. You don’t need to suffer from cutting and designing because Cricut machine will do it for you. There are so many ideas you can find when you will do deep searching, but for me, it is better if you will think it on your own so that it will be unique. Well, cards are just one way to show your love and gratitude towards a person. We all have different ways to spend our vacant time well. Some just hold their phones, scrolling up and down, some go out with friends, some just sleep, and some has a good hobby like drawing, sewing, and quilting. For others, those kinds of hobbies are just a waste of time. But it is not. When you really have the fashion in the drawing, sewing, or quilting you can make it as a business at the same time you are having fun and enjoy doing it. If your hobby is quilting or sewing two or more fabric, then you won’t have a hard time thinking of a unique, memorable, and beautiful gift for someone. It may be inexpensive but it has sentimental value because you put an effort in there. We have this machine that can help you from quilting, it is the Cricut maker. It can do cutting, writing, and sewing for you. So, do you want to know how to use Cricut for quilting? Here are the ways on how to use it. Cutting is like the first step when you want to do a specific shape in quilting. It requires you a lot of time to cut the shapes one-by-one. But, by the help of Cricut maker, you don’t have to worry anymore about cutting so many shapes you want. It can do different shapes like square, circle, hexagon, and it can also cut a letter shape for you. Cricut maker is really a great help in cutting. The hard curves you are trying to cut perfectly can do by the Cricut maker, just like the curves in the letter shape. Well, not all the time you will let the Cricut maker do the cutting job. You can just cut one template from the maker then use the rotary cutter to cut the fabric that you will use in quilting. The templates can be chipboard or balsa wood. These materials have enough thickness that can cut by the Cricut maker. The cut templates can also be used in demo or tutorial about quilting. So, you don’t need to buy rulers or other straight edges to be used in your demo or tutorial class. It will save you money and time. You can also print phrase into your quilted fabric just like the words “Love”, “My Lovely Mom”, “You’re the Best”, or you can print your name or the name of someone to whom you will give the quilted fabric and serve as your give to him/her. You can print the labels by ironing it, there is a Cricut device that can do the ironing for you. Aside from labels or phrases. You can also add iron-on vinyl at the top of your quilt. This iron-on designs will give beauty to your quilt, and it can also serve as a short message. There is a washable fabric pen that you can put in the Cricut maker. When you have programmed words, the Cricut maker will write it on the fabric for you. Then after it has been written, it’s time for you to do the embroidery thing. You can also put embroidery design not only iron-on designs. After the embroidery and the quilting, you can wash off the pen guide by a washing the quilted fabric. After making a quilted one and looks like you want to put a simple design. Why not try to draw a stitching line by using washable fabric pen in the Cricut maker. The stitch lines can be 1 inch apart so that it will look good. Then stitch it by the Cricut sewer machine, make sure that the color of the string you will use will much to the color of the fabric. There you go. You already know the ways on how to use the Cricut for quilting and at the same time, you also have some ideas and designs for your gift. You can do more by the use of Cricut maker when you have a wide imagination about beautiful designs you can make and a lot of time to explore the Cricut maker. One of the best things about owning a Cricut is the possibility to make things that are personalized and special for family, friends, and of course, for yourself. However, if your crafting talents are being called upon for a friend or family’s wedding or if you are getting married soon and you want to make Cricut projects but can’t think of any idea then you’re in the right place. In this post, we have compiled 8 fabulous Cricut projects to help make your or your friend’s wedding more unique, special, personalize, and memorable. Don’t worry these Cricut projects for weddings are all easy to create and they only require a few materials. This fabulous Cricut idea is not only ideal for spring weddings, but it would be fantastic for a vineyard or winery themed event. Customize this project in Design Space with a few clicks. Another easy to make Cricut project that you can give to friends who are getting married soon. In fact, this simple yet fabulous case vase would be a nice addition to any home. To do this, you just have to use a Mod Podge for the inside, glitters, and vinyl designs for the vase’s outer part. However, if you have an idea about your friend’s favorite color, then you may want to incorporate a particular color of glitter to match as well. If you haven’t got a theme, venue, or date planned up till now, but you want to start creating crafts, why not consider making a countdown wedding sign for your big day. As a matter of fact, you will only need a chalkboard vinyl and use it to write words on the wood or Perspex. Other than that, you can also use a washable marker and a picture frame. This Cricut project will depend on the wedding’s theme. However, there are lots of things that you can do to make the tables look fabulous and amazing. You can simply decorate bottles and jars to place flowers in. In addition to that, create your own intricate cut file place names and you can make use of Cricut pens to write on them. A wedding will not be completed without a cake. Thus, if you want to make your cake look unique and more special why not create your own cake topper. In fact, there are now lots of people who are creating this craft. Either way, when you are doing this, make sure that your design has no gaps. And more importantly, it could stand by itself. Then cut it out on a hard backing such as chipboard or cardboard and vinyl or thinner pretty cover papers so that they will be held together. Bouquets also play a big role during weddings. Having that said, you may want to make your own bouquet to make it even more special using your Cricut. Actually, doing this Cricut project is fairly easy as there are lots of online tutorials and free flower templates which can help you create an eye-catching bunch of flowers. Doing a wedding sign without the aid of Cricut is possible. But, if you want to have a wedding sign that looks professionally made or you don’t have nice handwriting then a Cricut always come in handy. Either way, you can design it depending on your personal preferences. Your big day will not be completed without invitations. Fortunately, you can speed up the process of making your invitations with the help of a Cricut. Actually, there are lots of free and great templates on the Cricut site that you can use. However, if you want a fabulous holder for your invitation, you may want to invest in cut templates online. There you have it the 8 fabulous Cricut projects for weddings. Indeed, Cricut is very easy to utilize and learn. Thus, you are certain that you will be able to make all your wedding stuff ahead of time without giving up significant wedding planning time. Hopefully, this content has helped you a lot in making your dream wedding come true. Are you looking for Cricut project ideas that you can make for your new baby’s room? If yes, then you are in luck. In today’s post, we have compiled some Cricut projects for baby’s room. In fact, all the seven projects that we included in this are easy and simple to make. Plus the materials needed aren’t hard to find. Do you want to customize your new baby’s room? If so, why not make a DIY pillow using a Cricut. As a matter of fact, this project is very easy to make especially if you have the needed tools and machine. Either way, it will also look good on the glider particularly when you transfer your baby to his or her crib. Another adorable Cricut project that you can make and place inside or outside your new baby’s room. Without a doubt, a sleeping child is a great thing and nothing is not as good as that seeing your baby being roused from noisy visitors or guests. Celebrate your treasurable moment using sweet banners to hang over your nursery walls, doorways, and fireplaces. On the other hand, this Oh Baby banner is perfect for baby showers and more importantly, welcoming the newest member of your family. You can also incorporate a ribbon to the banner to make it a great souvenir for your baby. Either way, though this craft was designed and made by Cricut Explore you can still do this even if you don’t have a machine as there are lots of tutorials online that you can use as your guide and inspiration. With just utilizing freezer paper, you can easily make this delightful blanker using your Cricut. Actually, this is ideal for your upcoming baby showers and place it on your baby’s room afterward. Are you aware that you can make a dresser sticker with your Cricut? If yes, then that’s good to hear. This Cricut project comes in handy most especially if you are storing lots of stuff inside your baby’s dresser. You can use this to label every drawer so that you will be able to find the things that you are looking for with ease. Doing this is relatively easy. All you have to do is, create your images, make sure they sport the same color and so that you Cricut machine will recognize that you are cutting them on similar color vinyl. After which, put them all on a single cutting mat to cutting mat to cut them simultaneously. In fact, this will save a lot of time than cutting them individually. In this Cricut project for your new baby’s room, you will need a tape runner, white and pink cardstock that is cut into BABY blocks letters and image, as well as wood cube containers. After preparing all the needed materials, adhere the images, frames, as well as the letters to the sides of the wood cube containers using a tape runner. That’s it. There is no doubt this project is very easy to make. Thus, you can make several decorations and centerpieces around your baby’s room. Using the Cricut Explore, you can actually make bigger scale projects. In order to make a project like this one, you can make use of the 12 by 24 cutting mat. In fact, this Oh Baby wall decoration is a nice main point for your upcoming baby shower as well as to your baby’s room. On the other hand, you can also add 3D flower designs and some colors in order to make it livelier and more beautiful. In addition to that, you can access this Cricut project in Cricut Design Space. Don’t forget to grab a wood pallet where you can install your Oh Baby wall decoration. All the above-mentioned Cricut projects are awesome ideas and they are very easy to make too. Hopefully, you guys get inspired by our list that you will be eager to give your baby’s room a breathtaking view and ambiance. Do you want to keep your kids entertained and have fun during their leisure time or free time? If yes, then you have just visited the right place. When it comes to arts and crafts, there are plenty of projects which can be pursued using a Cricut. Actually, this product will let your kids make their projects a lot easier and more professional. Either way, if you’re looking for Cricut projects that your child can do then keep on reading. Below we compiled 7 fun Cricut projects for kids that are very easy to make and will boost your child’s creativity. This DIY fox notepad is very easy and quick to make using the cut file making it ideal for kids. In this Cricut project, you will need to prepare three various colors of cardstock such as black, white, and orange. In addition to that, you will need a notepad that is 3” by 5”. One good thing about this notepad is that it will close without using a Velcro Dot. With this project, your child will definitely have a lot of fun. And hopefully, you will allow your child to do this fox notepad. This bookmark can be made using colored pencils, glue, white cardstock, as well as Cricut pens. In the actual fact, this is a nice Cricut project for children simply because the Cricut machine will cut the photos and your child will do the rest. If you want to make this, you can open it in Design Space. Then load paper on the LightGrip Adhesive cutting map and allow the machine to do its work. However, make sure to add the Cricut pen into the machine. After which, let your child glue the cardstock’s layers and color the photos. This Cricut project is suitable for adults and kids. Rest assured you will love final product of this project. You can use the Cricut to print various photos and get some embroidery threads as this project is fun for anyone. A simple, yet adorable Cricut project that your kids will surely love. This project, on the other hand, is great for children ages 3 to 10. When it comes to cutting the pieces of this project you’ll need a Cricut Explore Air. This card that looks very amazing is very easy to make and assemble. Let your child choose the color wings that he or she wants. One of the best things about this Cricut project is that the wings will flutter as soon as you open it. Either way, there are myriads of tutorials online that your child can use when making a butterfly card. Teachers love receiving a bunch of flowers that will not wither but can be honed. Either way, if you would like to thank the teacher of your child, why not ask your child to do this Cricut project and give it to his/her teacher to show your appreciation. After all, this project is quite easy to make. Nevertheless, the materials needed in this Cricut project are 6-inch double-sided cardstock, finish paint, Mason jar, pencils, Cricut explore, and bakers twine. To begin with, paint the Mason jar. And while waiting for it to dry start working on the flowers. You can cut them using the Cricut. To offer the flowers some texture and dimension crumple them as soon as the flowers are cut. After that, insert the petals through the pencil’s eraser. Lastly, put the flowers on the jar and tie them using the baker’s twine. This do-it-yourself mini journal is very easy to make and looks cute. Further, this is ideal for kids who love writing. Apart from that, they can also use this as their art journal. This mini journal, on the other hand, would make a nice handmade present as well. Nevertheless, you can make this project using a Cricut mini machine. When it comes to fun Cricut projects for kids, indeed, there are myriads of options to choose from. So the question is which of these projects will you do? Christmas is a celebration of love, giving, and happiness. People around the world have their own unique ways to celebrate it. Some visit places they have never been before, some volunteers for a charitable cause, or some simply stays at the comfort of their home and gather with their friends and family. But one thing that is very common is spreading the Christmas spirit through Christmas cards. We are living in digitalized world where almost everything is possible with the help of technology – in just one click you will be able to send your Christmas greetings to someone. But nothing beats one of the oldest traditional way of doing that – Christmas cards. Christmas cards are very old yet very meaningful method to convey greetings and express wishes. Aside from the fact that it is very personal it also makes the person you’re giving it to feel extra special. Make a personally made Christmas card with a help of a cricut machine that they will surely treasure for a long time. A cricut is a machine that helps in making Christmas cards conveniently. It looks like a printer but do the job differently. Cricut uses a blade and rollers to cut out the designs you’d like to have on your card compared to a printer that prints your design on a paper. Basically, you will be needing a design and the machine will do the job for you. You can make your own design but for your convenience, you can simply use the internet to look for premade patterns. There are also software that you can download on your computer to customize these designs for a more personal touch. This one tells a lot about the color of Christmas – red and gold. Who says black and white is boring? You can also use plain colors to make it look more minimalist. If you’re not sure which colors to use, just play with it just like this colorful one. Show off their picture just like this one. You can also insert candid pictures to make it more fun. There are a variety of formats you can use. Think of a motif, will it be fully decorated by different art materials or will you be putting a lot of photos on the card itself? Just use your imagination to picture the card you want to make. Now that you already have an idea of how your card will be like, it’s time to collect the materials you will be needing. It doesn’t have to be very expensive. You can check if there are any old materials that you can reuse. Though you already have the ideal Christmas card, you might change some of the details later on while doing it so just be open and let your creativity be shown on the card itself. You might’ve used adhesives to glue some stuff so make sure to let your cards set overnight just to make sure everything is in its right places before giving or sending them to the post office. If you want to it to be more personal I would highly recommend for you to hand write it. However, if you don’t have the neatest penmanship you can also print out your message though no matter how hideous your handwriting may be, it’s the thought that counts, right? Christmas cards continue to stick around despite of all the technological advances. It’s one of the simplest gifts you can give on Christmas yet the sensation it generates to someone is incomparable. Receiving a Christmas card makes you realize how much that person cares about you. With the time and effort they have exerted just to make that card is already priceless. Nevertheless, the most memorable gifts are those from the heart so make sure that you’re putting your heart into that card. Merry Christmas! Looking to acquire a new vinyl cutter? Well, honestly it is hard to pick the best vinyl cutter to use at home especially if you don’t know much about this kind of machines. A vinyl cutter is a machine that is mostly used in trimming different shapes and letters on a vinyl or any kind materials. A home vinyl cutter is not actually a big machine but it actually looks like a computer printer in where you can also connect to your computer by a cable. This machine can be controlled by the computer to make sure that the blades of the machine move properly and cuts the perfect shapes and letters that you wanted. Below will be a list of different kinds of vinyl cutting machine to help you avoid picking a bad equipment to keep yourself from being frustrated and cause failures with your project. This vinyl cutter has a great potential to satisfy all your needs, it is designed to cut from the basic Do-It-Yourself (DIY) crafts to your most complicated projects. The most fascinating thing about its feature is the machine’s capability to work wirelessly by connecting it with your device via Bluetooth. Meaning that you can also send images from your devices like phone, mac, tablets or PC for the machine to cut a material. Since this is intended for home use only this Cricut Explorer Air can improve your creative potential into another level. You can make all kinds of invitations, decorations, and favors so much easier and you can also add your personal touch. The Cricut Image Libray has more than 50,000 of images, fonts, and projects present so creating incredible designs would be endless. Does a dual carriage in one step for cutting and scoring or writing and cutting. By using this machine you can enjoy a new level of achievement, work easily with a lot of different types of materials, and you can almost do any kinds of DIY projects without any hardship and this is because of the newly improved design of the machine’s expandable suite of tools and its new rotary blade. The Cricut Maker can smartly adapt to any kind of materials from the softest fabric to tougher ones like matboard, leather, and balsa wood. Also, this machine offers an excellent toolset where you can easily cut, score, and write in different kind of materials with control and precision. The features of this machine don’t stop there because it also offers the possibility to constantly expand by bringing more tools any time. This machine can easily be used by novices and its perfect job of cutting materials will surely catch a lot of attention from DIY enthusiasts and crafters. Seeing how this machine executes its flawless cutting job and its multiple features to make the process much easier, the cost will be rather low and because of this, it is highly recommended. The newest model of the Cricut Explore with its new features will catch the attention of people that are into scrapbooking. The new model is set to cut much faster than the older models. Cricut surely implemented the quote “Time is Gold” on the new Explore Air 2, they have installed a fast mode in the cutter to improve its speed performance for the benefit of the use. Aside from speed, the machine can also cut through materials like vinyl, cardstock, iron-on and to thicker materials like the leather. If you are the kind of person who values details in their crafts then this machine suits you the best since this machine can cut the finest details on the material of your choice. Another feature of this new model is the Smart set dial, it always finds the best setting that suits your project. The machine also supports Bluetooth devices making it easier to send and upload customized images to the cutter. You can create your own design on your phone, computer, iPad, or iPhone and then with just one click, the vinyl cutter will receive the file and immediately do its job. The Cameo 3 is the new installment of vinyl cutter after the Cameo 2, the new machine still has all the great features of the old model but with new additions to make the upgrade worth it. Since technology keeps advancing at a fast pace, a lot of industries, including vinyl cutting industry are struggling to meet the neverending demand for improvement. Like other vinyl cutters, this machine also has a Bluetooth receiver that allows users to send their crafts wirelessly without worrying about plugging the cables into their right places and the machine doesn’t always need to be connected to the computer. This vinyl cutter can also cut through various materials like vinyl, paper, iron-on, matboard, leather, denim, and much more. Finding the best design for your craft is not easy but with the help of the Silhouette Studio, which is a free software by the Silhouette, it will lend you a hand by suggesting their ready-made designs from their store and will give you the option to customize it on your own. This vinyl cutter is much smaller compared to the Silhouette Cameo but it still offers a decent performance and great flexibility. Apart from its size, it can still cut through a wide selection of materials in quality same as other vinyl cutters. The machine is highly portable since it only weighs in 3.5 pounds and measures up to just 16.25 inches. Despite the machine’s small size, the excellence of its performance can still keep up with other vinyl cutters that are bigger than its own size. The cutting process of the Portrait is simple and easy as you’ll just need to connect the machine on your computer with the provided USB cable and then you can start with your work. For those who are looking for a balanced investment, the Silhouette Portrait will be the best choice for you, it is simple, lightweight, flexible, and it offers a wonderful quality of its performance for your crafting needs. Both brands of the vinyl cutters offer the same quality of performance. In buying the best vinyl product of your own personal use, do not just look at the speed, price, and the force of it. Because even if you buy the most expensive and fastest vinyl cutting machine, if the quality of the cut does not meet your standard then it is just a waste of money. The best strategy when purchasing this kind of machine, you should consider thinking about how complicated your designs will be, how thick or thin, and choose a company’s product that will offer you the best customer support service to help you with your problems if needed.